Filming with otters is never easy. You can imagine what happened 0.05 seconds after this photograph was taken. On the other hand, our tame otters will spend ages drying off after a swim. The easiest way to photograph our Asian short-clawed otters is when they are elevated in some way. Rudi is good at climbing but will descend with caution as he is not built to jump. 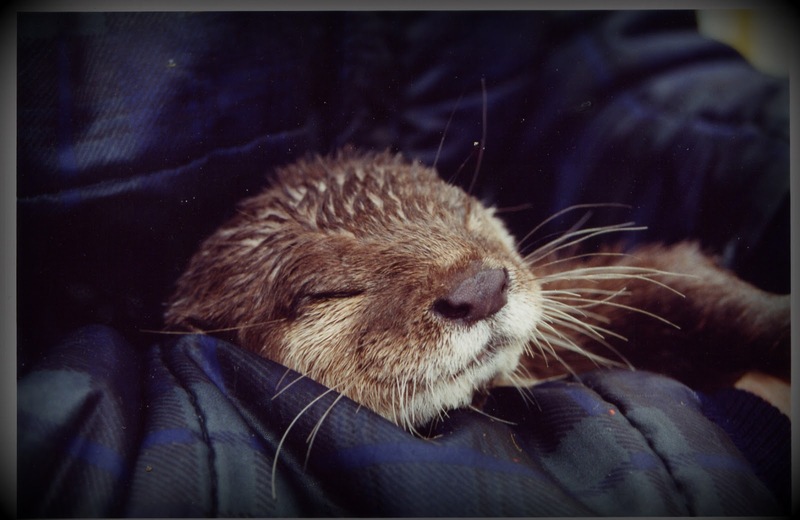 Often the script calls for an otter to be swimming underwater. Whilst this is possible it takes a long time to capture a sequence. A whole day was needed to take one underwater photograph for the scene in The Waterbabies. Here the little boy playing Tom is letting a young otter smell his hand. Much depends on the confidence of the actors appearing with the animals. Whilst Belinda is completely relaxed in my father's arms, she remains a wild creature and it takes her time to get used to strangers. 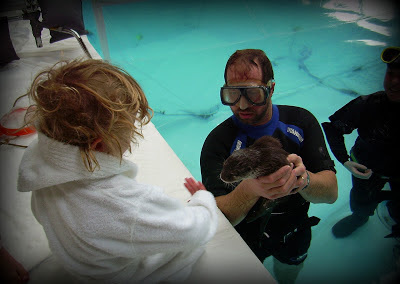 This little girl who appeared in the drama series 'The Secret of Eel Island' was wonderful with the otters. Many of the scenes were set on a houseboat which worked well as they could not jump off it and there was no chance for them to off run into the woods. Oddly our otters don't like swimming in our lake. I think Adam Henson must have lost one here. No, he was after a pig. At least you can carry an otter about and hold one in your arms.